Earlier this year, in his address unveiling this new theme, President Barry reflected on his being a Bahamian, an islander. To him, the sea that surrounds him represents distance and connection. While we may have different nations, different cultures, and different languages, the sea is the same. The sea gives us a sense of connection, a sense of inspiration, a sense of longing for something that is just out of reach. And yet, it’s much closer than we think. As a Navy guy, you can guess that President’ Barry’s remarks hit home with me. Initiative – take action on your ideas and observations. Don’t keep it a secret – give me a call, present it to the board, speak up at a Club Assembly. Find a hole and fill it. Volunteer when asked, help where you can. Inspire others with your Initiative. Example – to conduct our business and personal affairs with the highest level of ethics and ideals, to live the Four-Way Test, to be the motto of “Service Above Self”. Inspire others with your Example. Enthusiasm – to have fun and fellowship in all that we do. Meetings, service projects, parties, District functions. Rotarians are a great bunch of people. Show it with your participation, show it by having fun. And if you aren’t having fun, I refer you back to “Initiative” to take action to make things better. Inspire others with your Enthusiasm. Initiative. Example. Enthusiasm. Be the Inspiration! I wish to recognize a new member of our Club who embodies all of these attributes. Before her recent, official induction into our club, she spent a day in Mexico building a house. Utilizing her artistic talents, she voluntarily provided a beautiful, festive entryway to our All-Star Classic games. And immediately after her induction, she agreed to co-chair our Teach Recognition Luncheon. Judy Bradt – thank you for a great start as a Rotarian and for being an inspiration to us all! 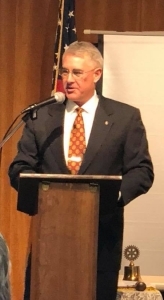 …we are in the Happiness Business as Rotarians, working at the basic and lowest levels of the human existence to pave a path for a happier life. When we support local non-profits who are doing good work in our local community with our time, talent and treasure, we are in the Happiness Business. When we provide dental health education and screening to hundreds of school kids, we are in the Happiness Business. When we build a house in a day for a deserving family, we are in the Happiness Business. When we provide scholarships to college students, a platform for High School students with our speech contest, and recognition to high school teachers for their efforts, we are in the Happiness Business. And when we are together as Rotarians, at meetings, while learning from our speakers, when working side-by-side on service projects and fundraisers, and while socializing amongst ourselves and with our guests, we are in the Happiness Business. Embrace it. Enjoy it. Own it with Initiative, with Example, and with Enthusiasm. 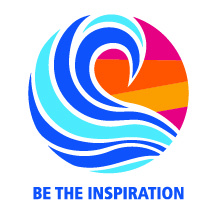 Be Rotarians and Be the Inspiration! I look forward to a great Rotary year of fun, fellowship and service.